Have you ever been cruising along in life thinking everything was generally fine yet experiencing a nagging edginess as if your happy, go-lucky mojo had gone awry? Have you ever retroactively identified that you were stressed once the stressor was removed? This might sound like the makings of a snazzy infomercial for a magical stress-relieving pill; however, I promise you it’s not. Rather, it’s a realization I had yesterday night. Way back in early September, I mentioned that our kitchen was torn apart due to a leaky roof and leaky walls (note: our building is only seven years old). Well, it remained in shambles until yesterday. We had a full seven weeks of ripped open walls, cabinets in our living room, and granite counter tops adorning our floors. For the first several days, I was in a mental battle with the reality that there wasn’t a set end in sight for the chaos. I wanted to know the date that my usual kitchen life could resume. However, as soon as they opened the walls, things became complicated (e.g., black mold, not knowing where the water was getting in, etc). After letting the stress of the situation grip my day-to-day lighthearted happiness for that first week, I put my foot down and decided I wasn’t going to let it get to me. After all, there are much worse and far more stressful things in life. Dan and I formed new routines around the construction zone and found our groove in a cabinet-less kitchen. I even figured out how to work around and on the kitchen gear that inappropriately accessorized our living room. It turns out that granite slabs on the floor make excellent substitutes for workout mats. I yoga-ed and burpeed my way through September and most of October on what we once knew to be our counters. However, despite my declarations of acceptance and new workout routine, I felt on-edge and out of sorts for much of the last several weeks. I kept blaming it on the transition from summer to fall, but my go-to fall funk fixes weren’t having the same helpful effects that they always do. It wasn’t until I walked into our place after work yesterday and saw that our kitchen was almost completely back to normal that I realized how much our home being in disarray had been affecting me. When I turned the corner and saw the cabinets hanging on the wall, I reflexively let out gasp of air as if I had been holding my breath since this whole process started so many weeks ago. As someone who relies on routine and prefers to be in control, having no control over this particular situation for an extended period of time got the best of me. Plus, the loss of control was occurring in and around a room that is the heart of our home: the kitchen. Although the situation initially seemed silly to be stressed out over, I now realize that had I offered myself some self-compassion and understanding early on, I might have avoided a consistent undercurrent of stress. C’est la vie. 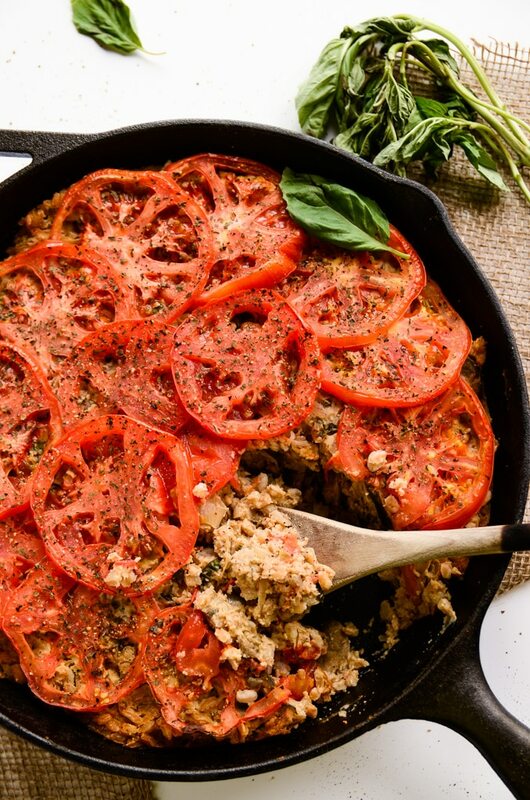 Nutty farro and sautéed veggies are cooked, tossed in a creamy vegan cheese sauce, topped with an eye-popping array of tomatoes, and baked to perfection. 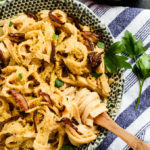 The “cheese” sauce is lower in fat than more traditional vegan cheese sauces because the primary ingredient in it is eggplant rather than cashews. I wish I could take credit for the brilliance of using eggplant as the base in this sauce, but the credit is 100% owed to one of my absolute favorite blogs, Minimalist Baker. 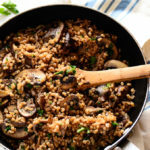 I altered their recipe quite a bit to fit the flavors in this farro bake, but followed the same technique of broiling and blending the eggplant with other flavors to create a super-creamy cheese sauce. That cheesy deliciousness coats the farro, mushrooms, tomatoes, and shallots in most wonderful way. 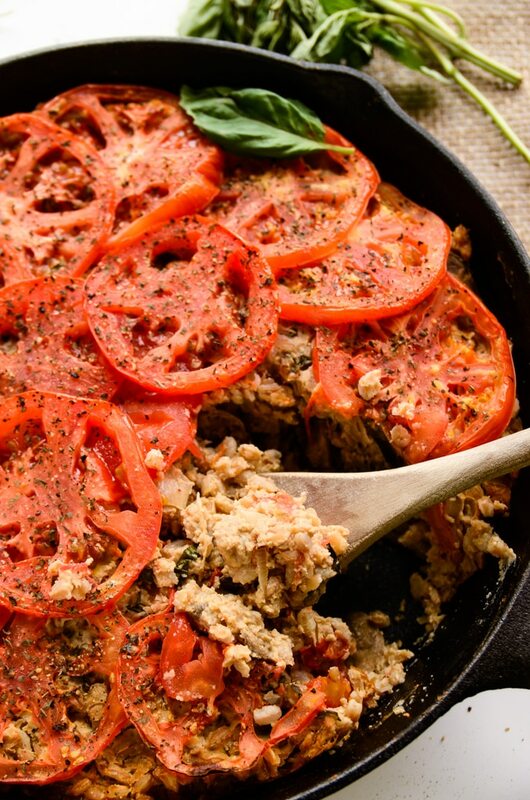 Then, the flavors meld together even more as they bake up in the oven under a sheath of tomatoes and herbs. 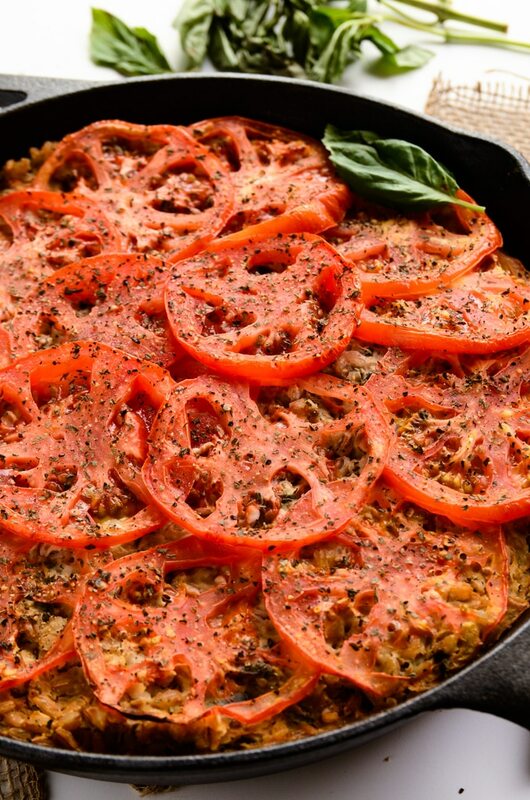 The result is like a nuttier, veggie-laden version of mac and cheese. Perfect for chilly fall nights and offering oodles of comfort in both stressed-out and stress-free times. 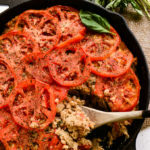 Nutty farro and sautéed veggies are cooked, tossed in a creamy vegan cheese sauce, topped with an eye-popping array of tomatoes, and baked to perfection. 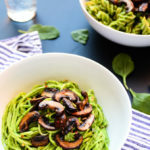 The "cheese" sauce is lower in fat than more traditional vegan cheese sauces because the primary ingredient in it is eggplant rather than cashews. I wish I could take credit for the brilliance of using eggplant as the base in this sauce, but the credit is 100% owed to the lovely Minimalist Baker blog. I altered their recipe quite a bit to fit the flavors in this farro bake, but followed the same technique of broiling and blending the eggplant with other flavors to create a super-creamy cheese sauce. Add the eggplant rounds to a colander, sprinkle liberally with salt, and let them "sweat" for 30 minutes. Thoroughly rinse off the salt and pat the rounds dry. Spread the eggplant rounds across a baking pan and drizzle with the olive oil. Broil on high for 3-4 minutes (watching carefully), flip over and broil another 3-4 minutes (again, watching carefully). Add the cooked eggplant to a blender along with the water, nutritional yeast, tahini, lemon juice, garlic, sea salt, black pepper, and arrowroot powder. Blend on high for 1-2 minutes or until the mixture is smooth. Transfer the cheese mixture to a medium sauce pan and whisk continuously over medium heat until thickened. Remove from heat and set aside. 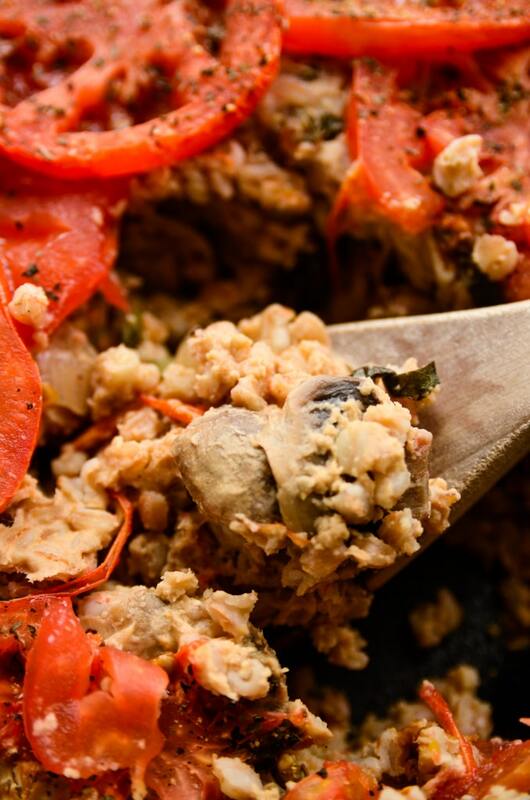 Make the farro while the eggplant is "sweating" by adding the farro and water to a large sauce pan. Bring to a boil, reduce heat, and simmer for 30 minutes or until tender. Drain off the excess water and set aside. 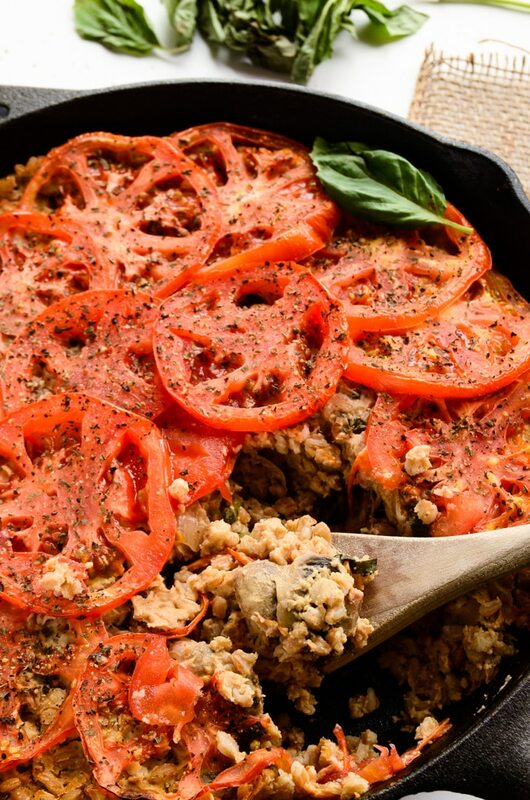 While the farro is cooking, heat 1 tablespoon of olive oil over medium heat in a large oven-safe pan (e.g., cast iron skillet). Add in the sliced mushrooms, cherry tomatoes, and shallots. Cook for 13-15 minutes or until tender, stirring occasionally. Once the veggies are tender, add in the cooked farro, cheese sauce, and fresh basil. Stir the mixture and smooth out in the pan. Arrange the sliced tomatoes carefully over the farro mixture and sprinkle with dried basil, sea salt, and black pepper. 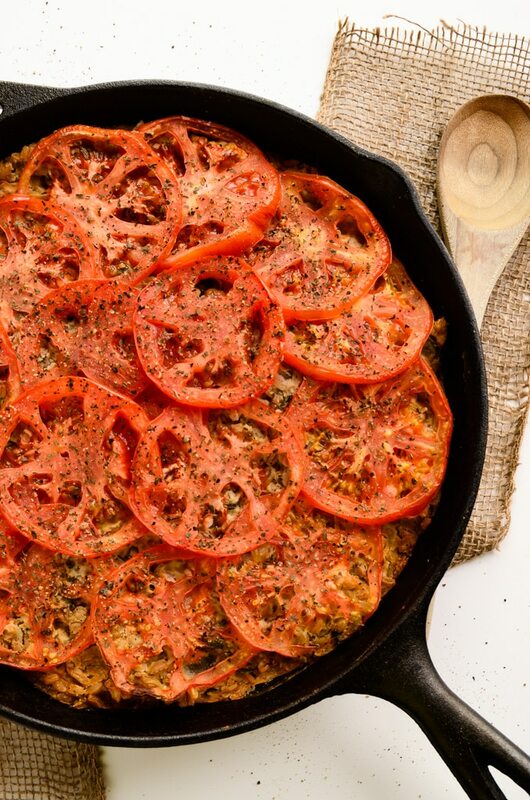 Bake the mixture for 25-30 minutes or until the tomatoes have roasted and turned slightly golden. 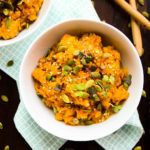 Remove from oven, scoop into bowls, and enjoy. I can so relate to this, sometimes there’s just something that’s putting me out of sorts and I’m not sure what it is, but when it gets fixed, it’s like everything just clicks into place! Also, I just discovered farro and I’m in LOVE! I’m glad you can relate, Abby! It’s crazy how one little thing that isn’t at the forefront of our minds can cause so much underlying distress, but it’s such a relief once it’s sorted out and our lives shift back into that normal groove. On a farro note: isn’t it so good? Love the nutty flavor and slightly chewy texture; so satisfying! Glad your back together again! This looks like a healthy version of comfort food. Look forward to trying it. Hi, Tracey! 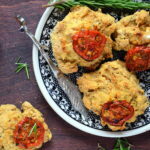 I’m so, so happy to hear that you made this recipe and enjoyed it! MB’s use of eggplant in a cheese sauce is one of the smartest recipe twists I’ve seen in a while, and I love that it tastes just as rich and creamy as it looks. Isn’t farro such a wonderful little grain? I love how nutty and full of texture it is; there’s something extra comforting about it! Thanks for taking the time to report back with your results! This looks fantastic! I adore farro but don’t use it enough, and it’s usually as a grain salad type meal. I missed the Minimalist Baker post for the eggplant cheese but absolutely love the idea. Thanks for sharing! We just tried this last night and I have to say, I didn’t know how much I would like eggplant sauce, but it was so lovely – I am scheming to use the sauce in other applications (ok, mostly for dipping tortilla chips). We used barley instead of farro since who the heck knows where the farro is in this city, but really delicious none the less. Thanks! Hi, Laura! I’m excited you stumbled across my site too, and I’m so sorry for the few day delay in replying. 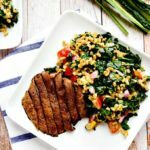 I would recommend substituting the farro with brown rice as it has a similar nutty flavor and chewy texture. I hope this helps and please feel free to reach out if you have more questions!